If preventing war is more important than engaging in it, the commissioning of INS Arihant, India’s first indigenous nuclear submarine is an important event in its military history. With Pakistan showing increasing belligerence, backed by an ambitious China, India needed to complete its deterrence triad. Till now, India was capable of retaliating to nuclear attacks from land and air. 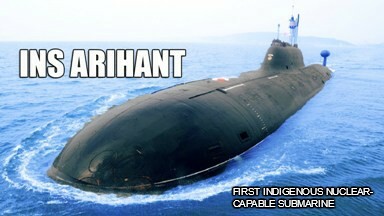 With the induction of INS Arihant, it is now capable of doing it from the deep sea, completing the triad. India has a no-first-use nuclear policy despite being a nuclear weapons state for long. But that has not prevented Pakistan from flexing its nuclear muscles. China is helping it in building resources in both conventional and nuclear warfare. On the other hand, the Chinese are known to have taken a liking to the sea route and keep sending submarines to the Indian Ocean. If India had not quickly built a deterrent vehicle like the INS Arihant, it would have further emboldened the Chinese navy. Military strategists believe that given modern destructive weaponry, wars would now be short and heavily destructive. In that case, deterrent will play an important role in preventing war. If Pakistan and China know that India has the capability to strike back swiftly from all three routes, they will think many times before indulging in a misadventure. Maybe, they will also cut back on nuclear blackmail. In any case, India need not worry much on that front now as it has strengthened its resources. How Will Pakistan Respond? Is War Inevitable Now?